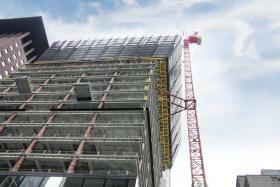 Doka congratulates: Gold for the Austrian young formwork engineers! The training in the Doka Forum in Amstetten has paid off for Michael Haydn and Alexander Hiesberger: The both Austrian young formwork engineers from the company Strabag won the gold medal at the “World Skills 2015” in the “Concrete Construction Work” category. “Concrete Construction Work” was listed for the first time at the vocational world championships. The first place goes to Austria at the first attempt. The training at the respective Doka branch has also proven its worth for the participants from Germany (2nd place) and Brazil (3rd place). All young formwork engineers were supported by Doka Brazil employees before and during the whole competition. Made in Austria. Once more the Austrian quality seal stands for top performance which is driven by exceptional engagement, precision work, reliability and utmost quality awareness – skills originating from a company’s most important asset: their employees. Walter Schneeweiss, Managing Director of Doka Austria, is delighted that Doka could be a partner at World Skills 2015: "For Doka, it was an excellent way to enable a wider audience to experience the brand. Our sincere thanks goes to the Austrian Chamber of Commerce and especially to Thomas Prigl who created the ‘Concrete Construction Work’ category." Thomas Prigl advocated personally that the category should be included in the contest for the first time this year. The Senior Expert and trainer of Michael Haydn and Alexander Hiesberger is proud that the premiere gold medal went to Austria. "The award ceremony was one of the most emotional moments that I experienced in Sao Paulo - 20,000 people cheered our winners on. The feeling is simply indescribable! We want to thank Doka for their support with formwork equipment and personal consulting before and during the active competition phase." The event which turned out to an international stage for professional fields of technology, industry and service attracted more than 200,000 visitors. Doka Brazil supplied the whole formwork for the competition, in concrete: the Framed formwork Frami Xlife (worth 110,000 Euro). The World Skills 2015 took place August 11 to 16 in Sao Paulo, Brazil. Skilled workers all over the world demonstrate their abilities at the international vocational competition. The next championship will take place 2017 in Abu Dhabi. Thank you for your interest - Doka congratulates: Gold for the Austrian young formwork engineers!. Thank you very much for your interest - Doka congratulates: Gold for the Austrian young formwork engineers!.